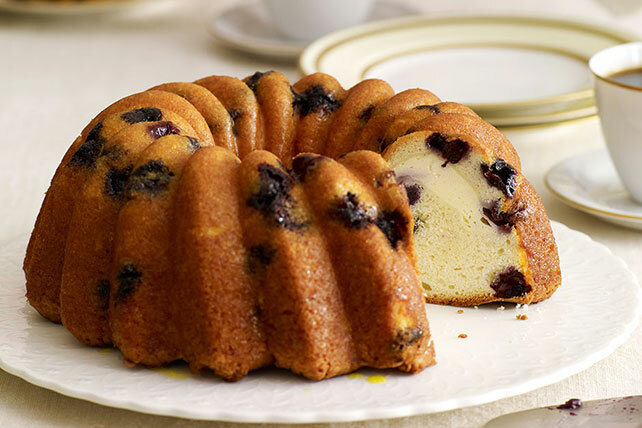 Mix tasty fruit into a deliciously moist Lemon-Blueberry Cake with a smooth and creamy swirl. Lemon-Blueberry Cake is made with JELL-O® gelatin, fresh berries and cream cheese for a remarkable dessert experience. Your next get-together is certain to be a memorable time! Beat cake mix, 3/4 cup water, egg whites and oil in large bowl with mixer until blended. Add 1/4 cup dry gelatin mix; beat on low speed 1 min., then on medium speed 4 min. Stir in berries; set aside. Beat cream cheese and whole egg in small bowl with mixer until blended. Pour half the cake batter into greased and floured 12-cup fluted tube pan or 10-inch tube pan; cover with layers of cream cheese mixture and remaining cake batter. Bake 45 to 50 min. or until toothpick inserted near center comes out clean. Cool cake in pan 10 min. Loosen cake from sides of pan with knife. Invert cake onto wire rack. Gently remove pan; cool cake completely. Place cake on plate. Microwave 3 Tbsp. water in microwaveable measuring cup on HIGH 30 sec. Add to remaining dry gelatin mix; stir until dissolved. Brush onto cake; let stand until absorbed. For a sweeter cream cheese filling, add 1/4 cup sugar to cream cheese mixture before using as directed. Prepare using JELL-O Lemon Flavor Sugar Free Gelatin and PHILADELPHIA Neufchatel Cheese.